The Most Capable rotary ATV mower on the market!! 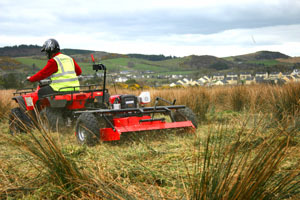 These mowers are very capable machines depending on the engine size you choose they can tackle anything from topping light paddocks to working with extremely dense vegetation such as rushes. With the Wildcut running at 2 1/2 times the speed of a tractor topper, work results are very impressive for their size. Need a topper for your tractor? 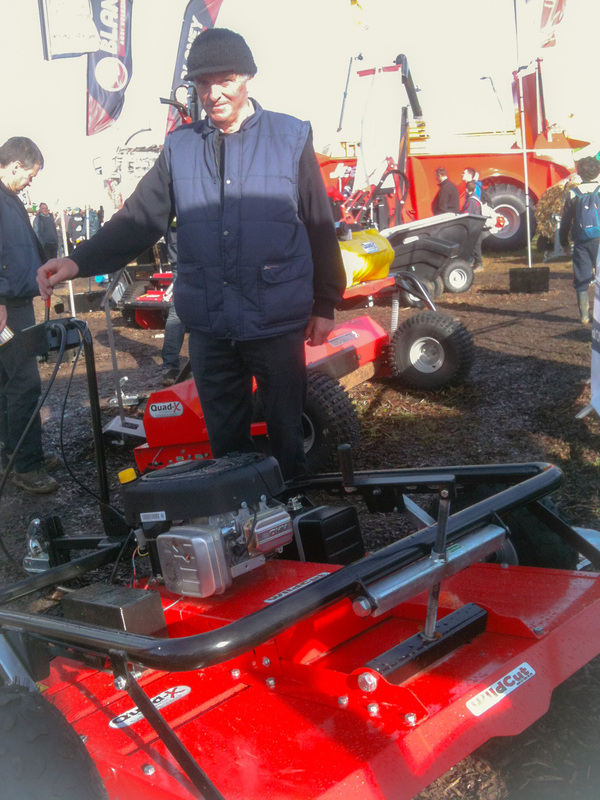 Check out Blaney Agri to see what Mowers we can offer you in the tractor range! The medium duty Wildcut™ is ideal for topping paddock areas. It is available in a choice of 2 Briggs and Stratton engine sizes, 12.5hp (recoil) and 13.5hp (electric start). The Wildcut™ ATV Mower is more efficient than a flail mower with higher work rates and lower maintenance costs. Fitted with 15-6×6 wheels or optional 19-7×8 wheels. 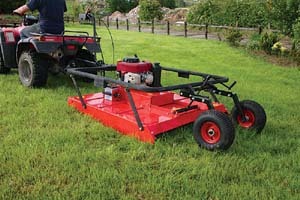 The heavy duty Wildcut mower is suitable for topping areas of overgrown vegetation including light rushes, saplings and bracken. It is available in 15.5hp and 17.5hp Briggs & Stratton engine sizes, both electric start. Fitted with 19-7×8 wheels. 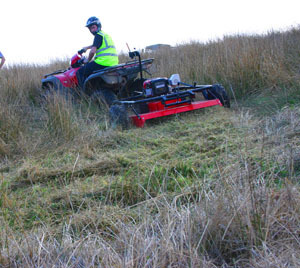 The extreme duty Wildcut mower is an extremely impressive ATV topper suitable for mowing in areas of dense overgrown vegetation including heavy rushes, heather and bracken. It is available in a choice of 2 Briggs & Stratton engine sizes, 16 v-twin and 18 v-twin, both electric start commercial engines which carry a 3 year warranty. Fitted with 19-7×8 wheels. 3-D finite element analysis on the mower deck ensures maximum strength and minimum weight, making the wildcut™ easier to tow and reduces the tyre indentation on the ground surface. The ‘floating’ deck ensures that as height is adjusted the deck remains parallel so the drawbar is always at the desired height and deck stress is minimised. 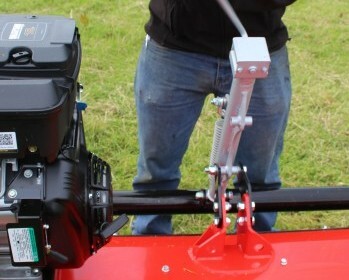 The ATV mower has a deck height adjuster to give you infinite cutting height option between 50mm and 250mm to suit varies types and heights of vegetation. The ‘floating’ deck ensures that as height is adjusted the deck remains parallel so the drawbar is always at the desired height and deck stress is minimised. The adjustable offset drawbar allows you to tow directly inline with the quad or to offset the machine to cut to either side. In comparison to our lawn/finishing mower which has fixed blades, the Wildcut™ ATV mower is equipped with hardened swinging blades which fold back to prevent damage to the blade if a small stone is struck. The blades then return to their original position automatically. The unique blade pivot to reduce the stone damage and helps slow the blades up when the blades are disengaged stopping them within approx. 6 seconds. The unique soft-start mechanism increases belt life. The belt engagement never needs adjustment and so maintenance costs are kept to a minimum. 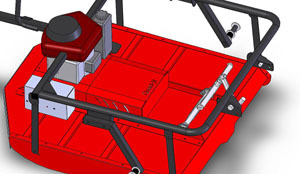 Machine Mounted Control Box – Simple & direct control of blade engagement & speed from quad seat. The machine mounted control box gives the user quick and direct control of the blade engagement and blade speed. The electric start 13.5hp mower can be turned on/off from the control box also. If you are using the Wildcut™ mower with an ATV you can reach the control box from seated on the quad. If something gets caught up in the blades or the blades strike anything which might be dangerous, this handy control box allows the user to disengage blades quickly without having to go near the mower, making it safer. The Wildcut™ mower has been designed to allow you to use the machine with a variety of different towing vehicles, with a 10 position adjustable tow hitch height to suit. 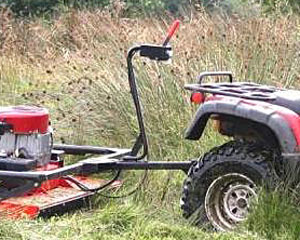 The Wildcut™ ATV mower is designed to fit on a 50mm tow ball and so is ideal for use behind a quad or jeep/4×4. Quad-X offer the option of a momentum dynamo which will make these mowers even more capable and impressive in very dense vegetation. 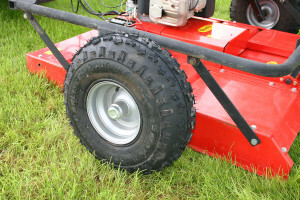 An optional wheel extension kit is available for the medium duty wildcut mower to allow for rear wheel positioning if cutting in a tighter area. 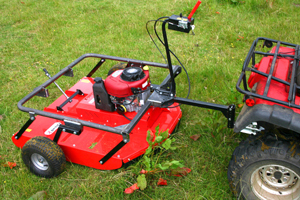 The Quad-X Wildcut mower is great machine which gives a very good clean cut. And it’s easy on the juice.